Who likes to go camping? It sure is not an activity for everyone, but hey, even the Big Bang Theory gang went on a camping trip of their own. Sure, they were there to observe an astronomical event, and they had tons of high tech equipment with them – not to mention food, but the point is that camping is still one of the most fun experiences that you can have. Of course, you have to be properly equipped so that you do not end up being miserable. That’s what the BioLite CampStove is for. I think. As the name implies, it is a stove that can be used for cooking (among other things) when you go camping. Actually, while it is designed especially for trips out in nature, the BioLite CampStove can be used wherever you want to. The beauty of this device is that it is very eco-friendly. In order to make a fire, you do not need the usual petroleum-based fuel. Instead, you merely twigs, leaves, or whatever you find along the trail (provided that you are allowed to gather those materials, that is). Here’s the brilliant part. Once you have a fire going, you can get physics to work. The BioLite CampStove makes use of the heat generated by the fire to cook your food or boil water or whatever you need to heat up. In addition to that, the heat can be converted to electricity that can charge whatever gadget that you have brought with you! Some may say that bringing gadgets on a camping trip defeats the purpose, but I totally disagree with that. 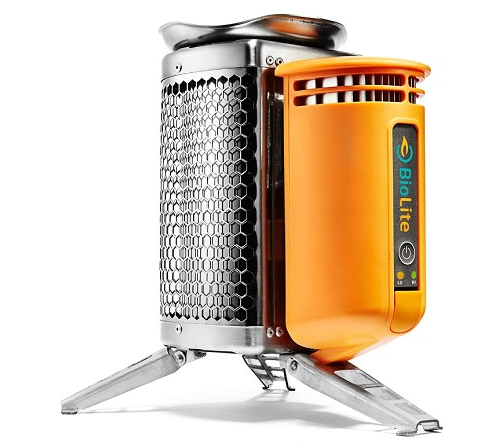 In any case, the BioLite CampStove can charge up most devices that are USB-compatible. Watch it in action. For $129, you can get this nifty camping tool at the BioLite shop.